Repair BKF File – No Relaxation Until Your Satisfaction! "Promising Tool to Fix Corruption in BKF"
Smarter BKF File Repair Solution: Cutting-edge technology and state-of-the-art facilities for performing the process to repair BKF file makes this software smarter than its counterpart products available in the market. Better Windows BKF File Recovery Solution: Using our tool, you can open BKF and restore Windows backup file contents in a better way than what you might do using any other such solution provided by some other player in the market. Why? Because we amalgamate fast BKF file repair process with easy to execute steps to repair BKF file. Faster BKF File Restore Solution: Fast process of recovery comes with the use of fast recovery algorithms which we specialize in! So, you get a faster process of backup data restoration if you associate with us and invest in our faster than other software solution. Easier Repair Corrupt BKF File Solution: Needless to say as it is very well-known that BKF file products have set the benchmarks for easiness, simplicity and intuitiveness; and this easiness expertise will continue to remain the major aspect acknowledged by us. BUY – Our Product Always Comes for a Low Price! Every good thing has its price, but this good solution for backup data restoration comes for a very small price but give huge returns in the form of your most crucial and extremely significant data, losing which could have brought you under a total loss situation. Saving yourself from such huge loss costs a little investment into our BKF Recovery software Full Version. 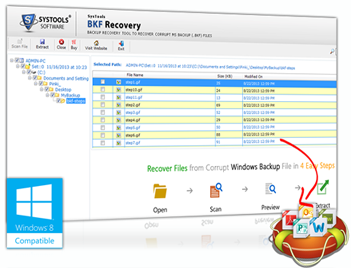 I am the user of BKF Recovery product; I used this fantastic tool to fix my windows corrupt backup and it smoothly repair and restored my entire data from bkf. I am happy now getting back my crucial data files. Thanks BKF repair for providing such an outstanding solution. Yes I have got my data back just because of BKF Repair tool. It was about 254 GB and I was worried that it will recover or not? But BRT did it with great speed. Try it once, it works!